The successful continuation of their heritage poses a challenge for traditional companies. Once again, the French luxury brand Bugatti has shown that it can transform these challenges into unique models. With its one-off car, La Voiture Noire1 Bugatti has again proved that it makes the world’s most powerful, luxurious, and exclusive hyper sports cars. A pioneering spirit, a passion for perfection and the desire to continually redefine its limits have been the key characteristics of Bugatti since the brand was established 110 years ago. The new hyper sports car reflects Bugatti’s French heritage and its French identity—elegance through minimalism and refinement through intensification. This is a tailor-made creation only comparable with the haute couture of exclusive Paris fashion designers. La Voiture Noire is far more than a modern interpretation of Jean Bugatti’s Type 57 SC Atlantic. With its extended front end and the distinctive Bugatti C-line, the Voiture Noire creates an elongated impression with the elegant waistline defining the contours of the coupé. It reflects purism and elegance in the surfaces and the clear lines. The bumpers are integrated smoothly into the body and the windscreen seems to flow seamlessly into the windows at the sides like the visor on a helmet. With no irritating lines, the surface is “all of a piece” and there is nothing to disturb the optical flow. This means that the hyper sports car has changed its attitude and became a grand tourisme—ideal for comfortable travel on long trips. The heart of the new creation is the iconic 16-cylinder engine—unique in the automotive world and the peak of the engineer’s art. The 16-cylinder engine with a displacement of 8 litres develops 1,103 kW/1,500 PS and 1,600 Newton-metres of torque. Six tailpipes at the rear bear witness to its incredible power and are also a tribute to the 16 cylinders. For €11 million (before tax) they have already sold this unique car to a Bugatti enthusiast. It is the most expensive new car of all time. The car enthusiast is fascinated by the Atlantic; with the Voiture Noire, he has gained a vehicle that takes up the legend and carries the idea forward to the present day. 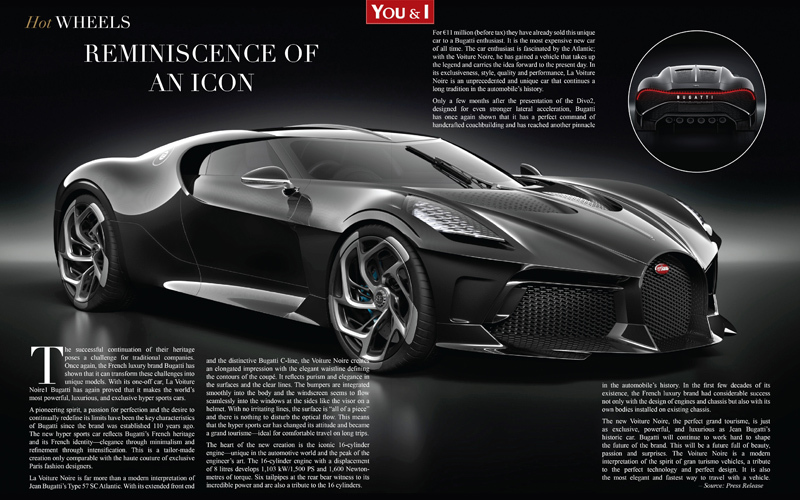 In its exclusiveness, style, quality and performance, La Voiture Noire is an unprecedented and unique car that continues a long tradition in the automobile’s history. Only a few months after the presentation of the Divo2, designed for even stronger lateral acceleration, Bugatti has once again shown that it has a perfect command of handcrafted coachbuilding and has reached another pinnacle in the automobile’s history. In the first few decades of its existence, the French luxury brand had considerable success not only with the design of engines and chassis but also with its own bodies installed on existing chassis. The new Voiture Noire, the perfect grand tourisme, is just as exclusive, powerful, and luxurious as Jean Bugatti’s historic car. Bugatti will continue to work hard to shape the future of the brand. This will be a future full of beauty, passion and surprises. The Voiture Noire is a modern interpretation of the spirit of gran turismo vehicles, a tribute to the perfect technology and perfect design. It is also the most elegant and fastest way to travel with a vehicle.